Heat 1 tsp of the remaining EVOO in a large nonstick skillet over medium high heat. Season the Cod with Salt and Pepper and cook until opaque throughout, 4 to 7 minutes per side. 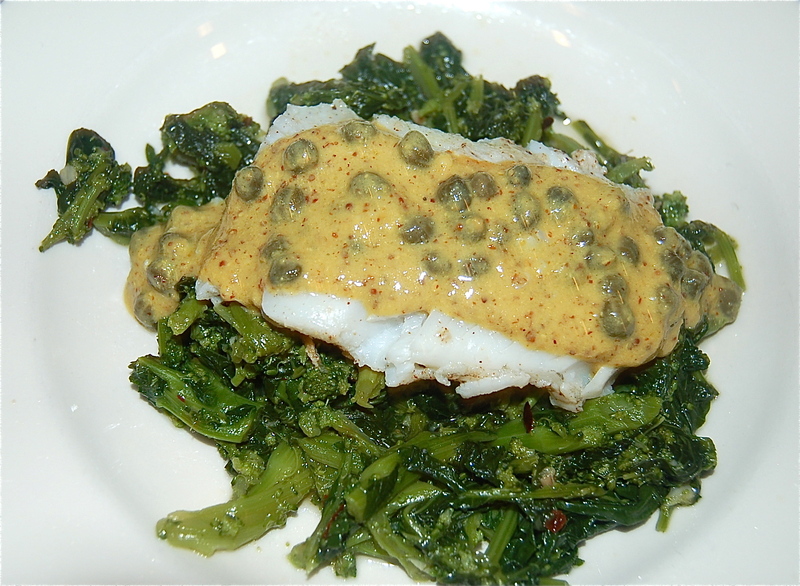 Serve the Cod, plated with a couple of spoonfuls of Sauce. 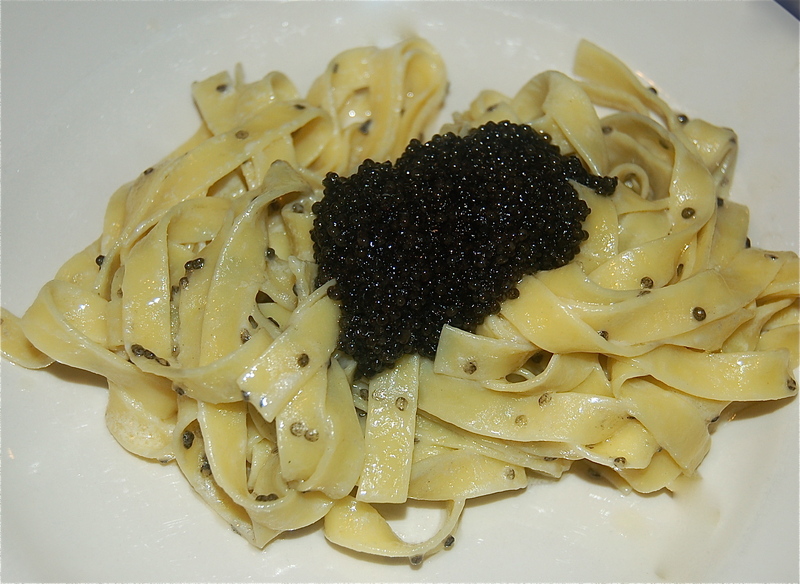 Without a doubt , try this recipe once and you will be as smitten as I am. Poaching the Calamari for an hour in EVOO and half a Lemon, and the Leeks for 20 to 25 minutes does wonders. The result is a tenderness and a flavor hard to describe, the photo does a better mouth watering job. 1. Preheat oven to 375. Rinse the Squid under cold water. Place in a Dutch oven. Cover with 2 cups of EVOO, add half the Lemon (reserving the other half for juice) and a pinch of Chile Flakes, and season well with Salt and Pepper. 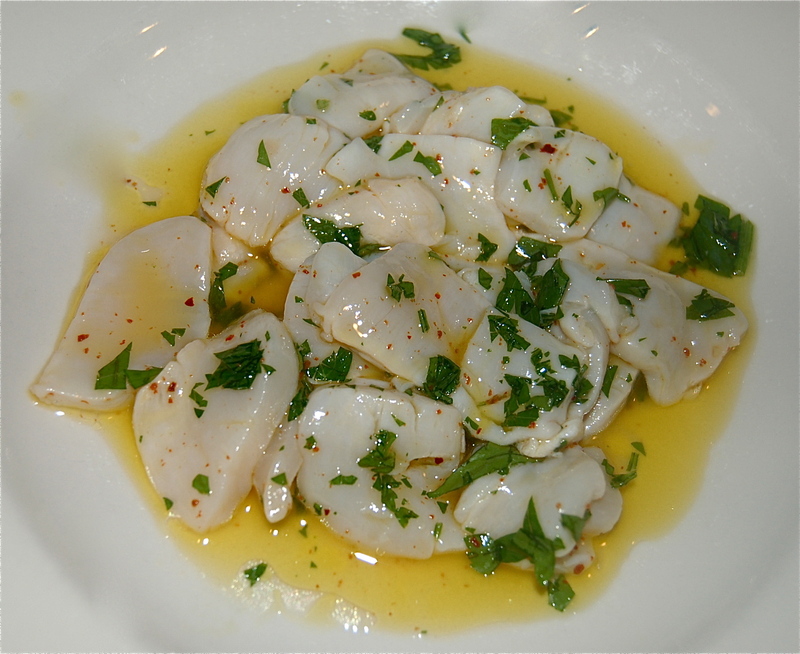 Cover tightly, and poach the Squid in the oven until fork-tender, about 1 hour. Remove from the oven, and allow to cool with the lid on for at least 25 minutes. 2. Meanwhile, toss the Leeks in a mixing bowl with 2 tablespoons EVOO and season with Salt and Pepper. Place Leeks in a single layer on a sheet tray, and roast until they are tender and beginning to caramelize, about 20 to 30 minutes. 3. Using a slotted spoon, transfer the Squid to a mixing bowl, and combine with the makings of a dressing: 1 tablespoon of the poaching liquid, 2 teaspoons Lemon juice, and a small pinch of Chile Flakes. Toss well, check seasoning, then add the Parsley, tossing again to coat evenly. 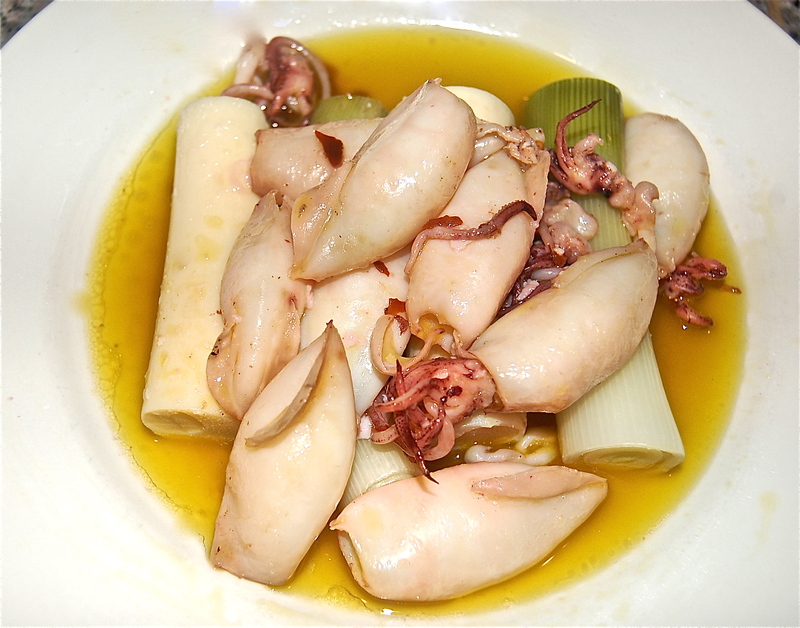 4.Arrange the Leeks and Hearts of Palm on 2 plates, and spoon the Squid over them, finishing with a drizzle reserved poaching liquid. 5. A Salad of AVocado and Onion is a fine side dish. This is a redux of a November 2011 dinner. The Smoked Pork Chop is an addition. Together they definitely complemented each other. 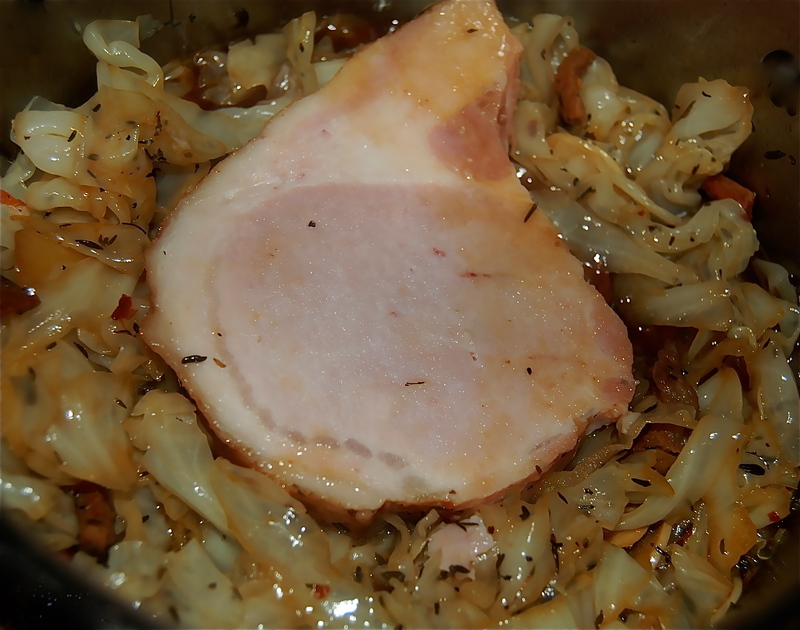 The Smoked Pork Chop is another delicious item available at our wonderful Smokehouse of The Katskills ready to devour, I simply warmed it in the pan with the Cabbage. A huge YUM. 1. Fry the Pancetta in a large pan until the fat has rendered. Remove from the pan to a small bowl leaving the fat behind. Add the Garlic & saute in the Pancetta fat, then add the ribbons of Cabbage, toss & saute to combine. 2. Add the Chicken Broth & Vermouth, the Thyme, Salt & Pepper, Red Pepper Flakes, cover & cook over high heat as long as it takes for the Cabbage to really tenderize, which should take 20 minutes or so. Keep your eye on the progress. Return the Pancetta to the pan & toss together. 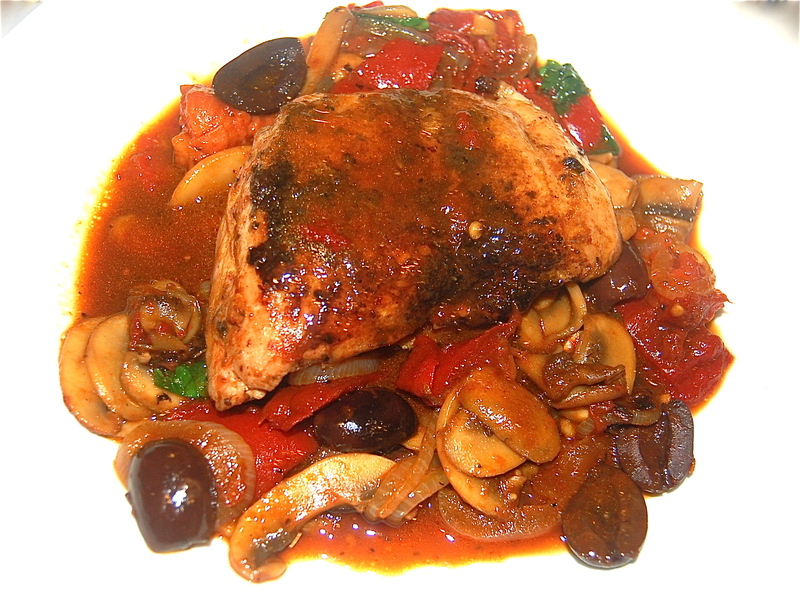 September 21, 2014 Spicy Boneless Thighs with Sausages, Black Olives, Tomatoes, & Mushrooms. 1. In a large casserole, heat the EVOO & saute the Onions until tender & translucent. Set aside in a large bowl. 2. Halve the Sausages & cook them until almost tender. set aside. 3. 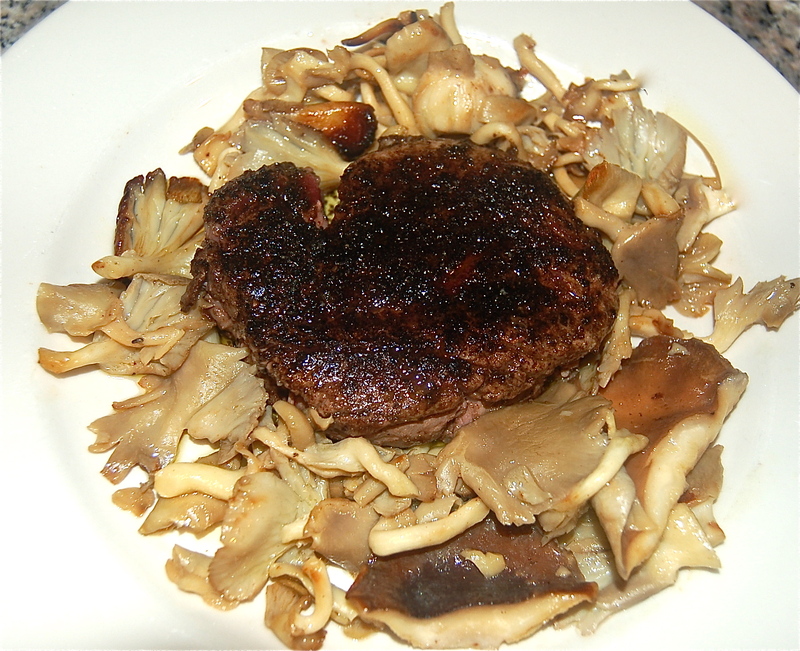 Add the Mushrooms & saute until tender & brown. Add the Roasted Peppers & the Tomatoes, saute & add both to the large bowl. 4. Add the Chicken Thighs, & cook for about 7 minutes to each side. Set aside with the Sausages. 5. Deglaze the pan with the White Wine, scraping up the pan particles. Add the Fondue de Poulet Gold & whisk them together. 6. Return all the vegetables & the Green Olives to the casserole & simmer for about 15 minutes to amalgamate the flavors together. 7. 15 minutes before serving time, return the Chicken Thighs & the halved Sausages to the casserole, & simmer over low heat. 8. To plate, add a Chicken Thigh & 2 half Sausages. surround the plate with the vegetables & sauce. Spicy Boneless Thighs with Sausages, Black Olives, Tomatoes, & Mushrooms.